This posting will review some of the material we have previously made available about the science behind our three Jewish markers in the autosomal 18 Marker Ethnic Panel. First, it may be worthwhile to recount the chronology of our testing innovations in this area. 2006 – DNA Consultants introduces the DNA Fingerprint Test, one of the first simple autosomal ancestry tests based on population databases. 2009 – Donald N. Yates, Ph.D., principal investigator, makes the discoveries in July that lay the foundation for the DNA Fingerprint Plus, rolled out in early September. The enhanced product includes simple autosomal markers for Native American, European, Jewish, Asian and African ancestry, based upon their frequencies of occurrence in these ethnicities. 2010 – Several important studies on Jewish genetics appear; DNA Consultants introduces Jewish DNA Test. 2011 – DNA Consultants releases version 2.0 of its autosomal population database atDNA, marking the addition of the population Melungeon (n=40). One of the first of the Jewish markers to be blogged about was Jewish II, characteristic of Ashkenazi Jews. 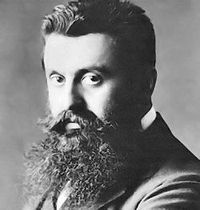 Theodor Herzl, the nineteenth-century Austro-Hungarian Zionist thinker-organizer who helped inspire the founding of the State of Israel, is an example of a famous Ashkenazi Jew. There was another post titled Jewish Marker II Statistical Notes. A post on Jewish I soon followed, together with a discussion about its European connections. There has been an ongoing discussion on the Jewish Forum on DNA Communities. Jewish III has been the slowest to emerge. Its Middle Eastern nature has been explored and expanded upon in several threads on DNA Communities. In the Fall of 2010, our project administrator tabulated results for more than 450 people who had ordered a Jewish Ancestry Test through our partner Jewish Voice. It was found that 99.97% showed at least one Jewish marker, that is, had some Jewish ancestry. Some had all three markers while others had a combination of the three in some way. The informal study indicated 74% of Jewish Ancestry Test takers had Jewish I, 30% had Jewish II and 82% Jewish III.